Mar 02, 2016 (LBO) – China is positive about Sri Lanka’s prospects as a strategically located platform for trade, investment and tourism, a statement issued following Minister Malik Samarawickrama’s recent visit to China said. 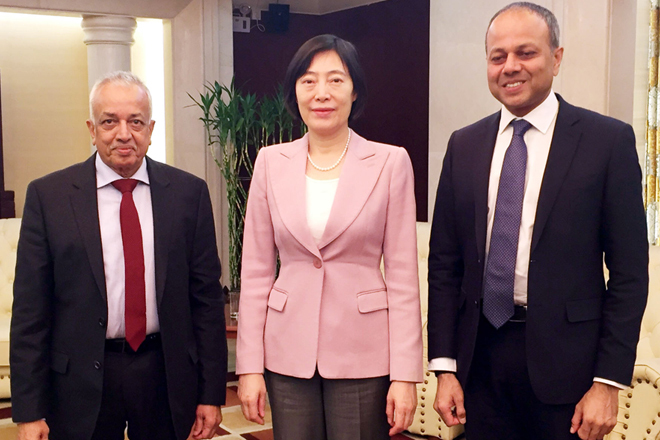 “They saw opportunities for strengthening bilateral cooperation and looked forward to Prime Minister Ranil Wickramasinghe’s visit to China in April to take the relationship to a new level,” Malik Samarawickrama, Minister of Development Strategies and International Trade said. Samarawickrama had meetings with Hu Xiaolian, chairperson, Exim Bank of China and Zhen Zhijie, governor, China Development Bank and reiterated that the government was accelerating the implementation of ongoing Chinese projects. He provided a briefing on a pipeline of new Chinese FDI projects, including the Economic Zone, ship repair project and airport development in Hambantota. The new infrastructure projects discussed included the extension of the Southern Highway, Kandy and Ratnapura Expressways and portable and waste water projects. He also drew attention to possible Chinese involvement in the Sri Lankan government’s development plans, such as the Western Region Megapolis project, which includes infrastructure development, involving elevated highways, light railway and utilities as well as real estate, both housing and commercial. Both sides recognized that China’s “Going Abroad” strategy and Sri Lanka’s very favorable location on the Maritime Silk Road provided a strong basis for strengthening Sino-Lanka economic relations, the statement added.